I was cleaning up around the place today and found a plastic bag in the weeds that I had put there at least ten years ago with a freshly skinned cougar head in it. A friend had shot it and gave me the head since it wasn't very big (about 7 1/2" long by about 5" wide). 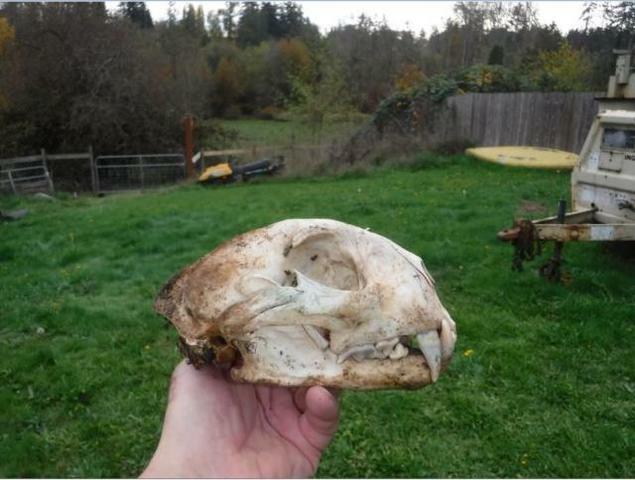 It's in good shape, a little dirty, has all it's teeth except for missing premolar. 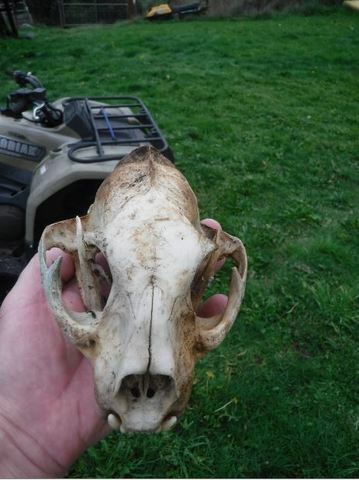 I have no need for it, I don't really want to educate myself about selling animal parts like cougar across State lines so I've decided to give away. I'm offering it to someone who is at least half way interested in collecting skulls, not someone who is just going to sell it. Maybe PM me a picture of the skulls you've collected so far or something like that. I can ship it in a flat rate USPS box for $13.65, it would at least be nice to get my postage returned to me once you get it. I'll post this on the Kids Forum also, I'll probably be a little more likely to give it to a kid if I find any who are truly interested. P.S. I know I can't ship it to California, sorry.